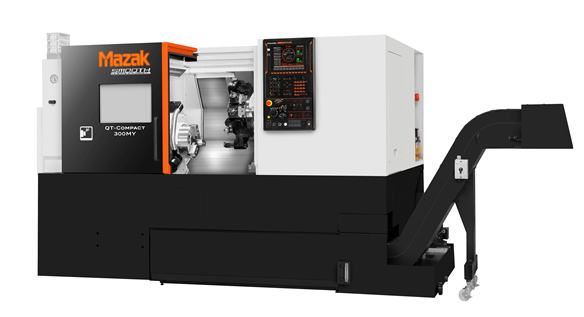 Yamazaki Mazak has extended its range of entry-level machines with two new turning centres designed for machine users demanding high quality at an affordable price. The new QUICK TURN COMPACT (QTC) and QUICK TURN PRIMOS (QTP) are both aimed at the general subcontracting market, specifically those subcontractors involved in small to medium size manufacturing operations. There are optional variants for each machine type, which should ensure that the correct choice of machine specification is much quicker for customers, with resulting shorter lead times. The QT COMPACT range is a high performance turning centre equipped with a Mazak manufactured driven tool turret with either 500mm or 1000mm bed and a bar capacity of ø65 mm or ø80mm. Each variant is available with an optional Y-axis, and /or an optional second spindle. There are two variants of the QT COMPACT available; the QTC 200 which is equipped with a eight inch chuck, a maximum speed of 5,000 rpm and a peak torque of 167 Nm, and the QTC 300, which has an ten inch chuck, a maximum speed of 4,000 rpm and a peak torque of 356 Nm. The machine is controlled by the SmoothC control, the latest edition to the Smooth Technology portfolio, incorporating state-of-the-art motion control technology. A productivity package is available and includes bar feed interface , parts catcher and higher power coolant options. The QT PRIMOS is a compact, high performance 2-axis turning centre with high productivity and a small footprint, making it ideal for subcontract manufacturers requiring simple turned components in volume production. The PRIMOS is available in three variants. The PRIMOS 50 S has a bar capacity of ø32mm, and is equipped with a 5,000 rpm 7.5kW spindle capable of 48 Nm of torque; whilst the PRIMOS 100 S has the same spindle speed but possesses a 9kW spindle and an increased maximum bar capacity of ø36mm, as well as a higher 75 Nm of torque. The PRIMOS 150 S has a maximum bar capacity of ø51mm and uses a lower speed 4,000 rpm 11kW spindle, capable of 131 Nm of torque. The machine is equipped with MAZATROL Smart conversational control. All of the PRIMOS variants are equipped with a Mazak-manufactured turret and are capable of rapid traverse rates of 30 m/min in both the X- and Z-axes. A large capacity standard oil pan, which comes as standard, reduces coolant temperature rise to ensure high accuracy machining. All variants are also equipped with a tool eye, which can be programmed for automatic tool measurement and compensation. The design of the machine enables easy chip removal from the rear, which allows multiple machines to be closely packed together. An optional integrated gantry loader is also available on all PRIMOS variants to accommodate automated loading for larger batch sizes and high volume manufacturing. Both the QT COMPACT and QT PRIMOS are equipped with direct drive spindles and full circumferential brakes, which are standard on Mazak machines due to their superior performance compared to belt drive spindles and conventional disc brakes. The use of direct drive also helps to ensure a smaller footprint for the machines. Whilst the machines are ‘entry-level’ there is no compromise on build quality, with both the COMPACT and the PRIMOS built in line with Mazak manufacturing and quality standards. In addition, customers specifying entry-level machines will benefit from the same levels of Mazak aftersales service and support as other machines in the Mazak range. 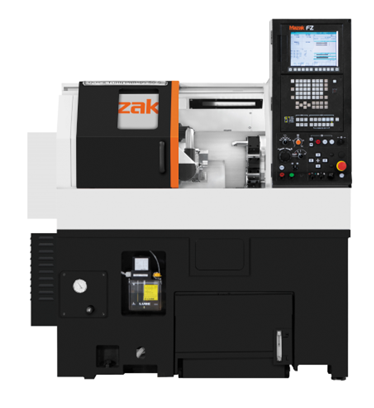 John Liverton, Product Manager at Yamazaki Mazak commented: “Entry-level machines have always been important to Mazak because one of our core philosophies is to support our customers through the different stages of their development, from turning through to more complex machining methods.